Every once in a while you’ll come across a video that has audio syncing problems. Sometimes it’s minor where the sound track and dialogue is off by a few milliseconds and it’s barely noticeable, other times it can be off by as much as a few seconds and this makes watching the video almost impossible. Rather than ditch the video, you simply need to fix the audio track so that it syncs with the video track, and that’s what we’re going to cover here. We’re going to use VLC to easily re-sync audio tracks to a video, by either offsetting the audio forwards or backwards. It sounds more crazy than it is, and it’s actually really easy to do, here’s how…. 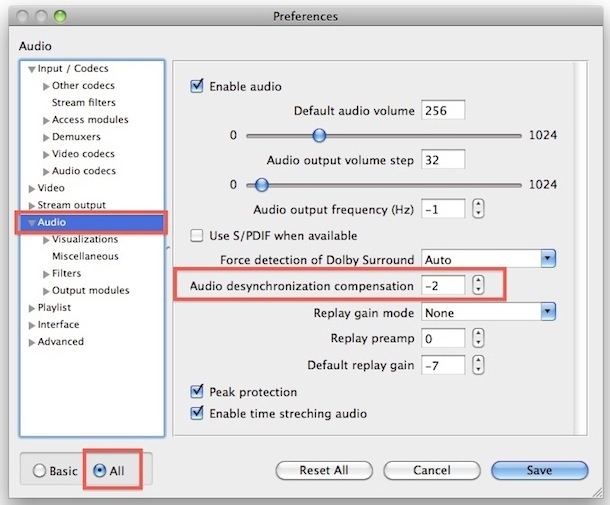 Remember that this is not permanent, and that the resyncing will only effect the current video when played in VLC. You can then just hit F or G until the video track is in sync with the audio track, usually dialog sequences are best for doing this, but you can do it anywhere with a video. These two methods work on all video types supported by VLC, whether it be a DIVX AVI, MOV, MPG, or just about anything else that VLC will open. A common misconception is that there is an audio syncing problem when the video or audio itself doesn’t load at all, this is probably not syncing but rather a codec issue. If you run into this, learn to watch AVI video on the Mac using something like Perian that has a wide codec support. In most cases, VLC will play the movie files as well though. The F and G keys retard and advance the audio delay by 50 ms while you’re playing, saving you the above hassle.